Two weeks ago, the Canadian hard rock trio DANKO JONES premiered a new single, “We're Crazy”, the first taste of the as-yet-untitled new album they're currently recording at Vancouver's Farm Studios with producer GGGarth Richardson (Rage Against The Machine, Red Hot Chili Peppers, Biffy Clyro, Rise Against). Today, the group unveils a music video for the song, which features live and backstage footage culled from recent performances at Germany's Summer Breeze festival, Belgium's Graspop Metal Meeting, Hollywood's legendary Viper Room and more. Check out DANKO JONES' video for “We're Crazy” on KNAC.COM HERE. 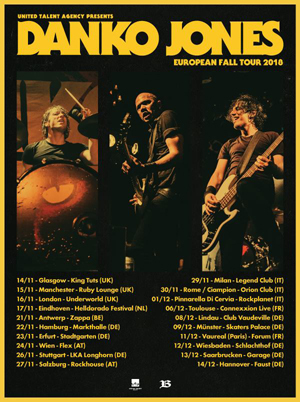 More information on DANKO JONES' new album – which will be released in the spring via M-Theory Audio (U.S.), Rise Above (UK), Indica (Canada, AU, NZ) and AFM (rest of the world) – will be unveiled in the coming weeks.